The Buttonwoods Museum invites all book lovers to be a part of the upcoming book reading and signing on Friday, October 30th. 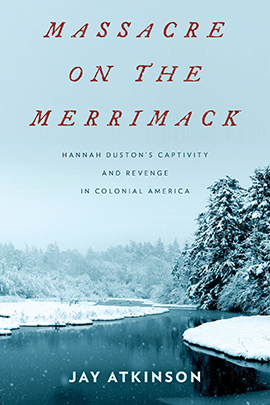 Come hear Jay Atkinson read from his latest book “Massacre on the Merrimack: Hannah Duston’s Captivity and Revenge in Colonial America”. Jay Atkinson is the author of 8 books. His first book, Caveman Politics, was a Barnes & Noble Discover Great Writers Program selection; Ice Time was a Publisher’s Weekly Notable Book of the Year and a New England Independent Bookseller’s Association bestseller; and Legends of Winter Hill spent seven weeks on the Boston Globe bestseller list. Atkinson teaches writing at Boston University. He grew up hearing Hannah Duston’s story in his hometown of Methuen, Massachusetts, which was part of Haverhill until 1726. 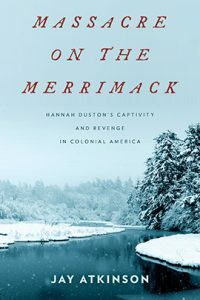 ~ “Jay Atkinson is one of my favorite writers, and Massacre on the Merrimack, detailing and important yet little-know episode of captivity and revenge in colonial-era Massachusetts, benefits from his accomplished writing and keen-eyed historical perspective.”-Chuck Hogan, author of The Town. This event is free and open to the public. Autographed copies of the book will be available for purchase.